BOARDMAN - Funeral services will be held Monday at 6 p.m. at the Higgins-Reardon Funeral Homes, Poland Chapel, with Msgr. 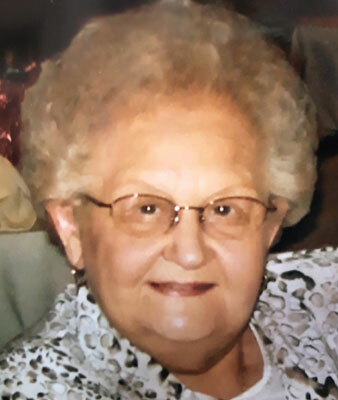 Peter M. Polando, for Dorothy J. Stosic Monaco, 89, who passed away Thursday morning at her home. Dorothy was born July 3, 1929, in Youngstown, a daughter of the late Jacob and Veronica (Hopko) Stanek. Dorothy attended Wilson High School. She retired from Chase Bank where she worked in their housekeeping department. Dorothy enjoyed going to bingo, casinos, and going to the park for their music concerts. She also loved traveling to Florida during the winter months. Dorothy is survived by her daughter, Lorraine Lesnansky of Youngstown; son, Matthew (Beth) Stosic of Youngstown; two stepdaughters, Yvonne (Frank) Melia of Poland and Francine (Harry) Arroyo of Boardman; a brother, John “Peno” Stanek of Youngstown; three grandchildren, Jennifer Al-Ababseh, Kurt Lesnansky, and Jennifer (AJ) Greenwalt; six step grandchildren; a great-grandson, Alex Greenwalt; and step great-grandchildren. Dorothy was also preceded in death by her first husband, Matthew Stosic, whom she married Sept. 29, 1956, and passed away in December of 1993; her second husband, Frank Monaco, whom she married Oct. 25, 1996, and passed away in June of 2014; two sisters, Mary Fedor and Helen Thomas; and two brothers, Joseph and John Stanek. Family and friends may call Monday from 4 to 6 p.m. at the funeral home. Dorothy's family would like to give a special thanks to Grace Hospice and her niece, Karly Hostetter for all of their care and compassion that was given.